Camp Artaban is an Anglican camp located on scenic Gambier Island. It provides children, youth and adults with opportunities for personal and spiritual growth in a fun, recreational environment. 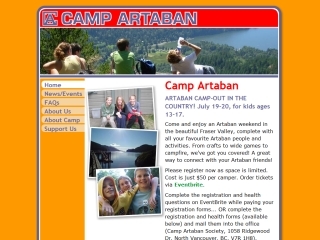 Camp Artaban's activities include sailing, canoeing, swimming, the Blob, hiking, volleyball, climbing walls, crafts, camp fires, music and games.